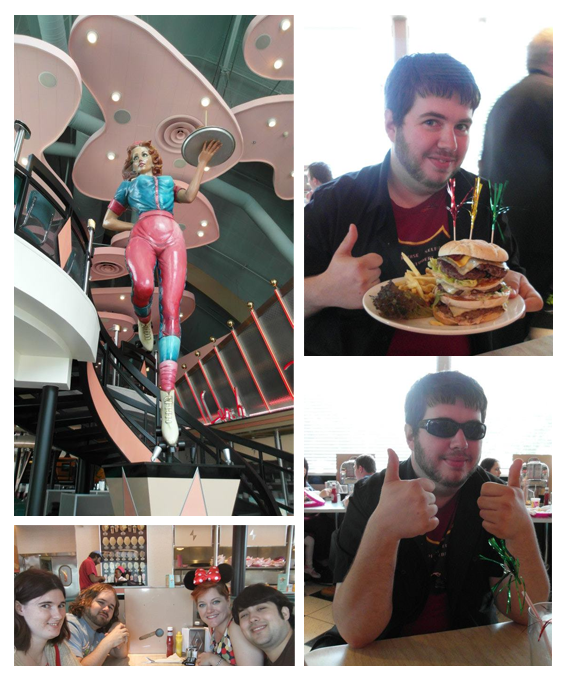 After the first park, we headed over to get lunch at Annette's Diner. It was actually my least enjoyable meal of the whole trip, but it wasn't horrible. Just way below my expectations, sadly. However, DC took them up on their mega burger challenge, where you get a free shake if you finish their whole multi multi multi burgered burger. And he did! Look at that sense of accomplishment, haha. Afterwards, we headed over to the main park. Excitement! As we got in, we were just in time for an awesome little parade! We watched it from the main gazebo and then it started to rain! Tragedy! So, we decided to hop on the train and do a loop around the entire park. I never actually use the trains and such in the Disney parks, but they're as much an attraction as the actual rides, so we stayed dry while enjoying a Disney railroad journey. We stepped off in Discoveryland, grabbed a fast pass for Space Mountain and then went straight to the Buzz Lightyear ride since it was indoors (still raining.) I love the Buzz ride. It's so simple but so, so much fun. Moose won. Why doesn't that surprise me? 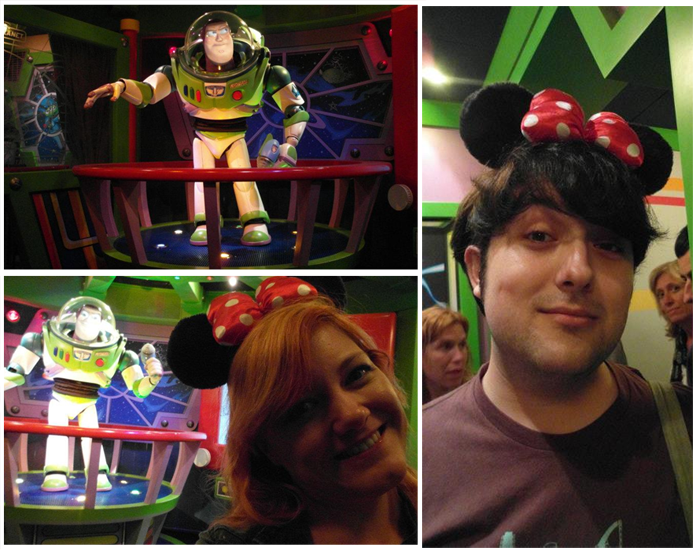 After Buzz, we went to Space Mountain, but in the queue I started getting a really strange headache. It felt entirely like the precursor to a migraine which I suffer from very rarely, but when I do get them, they slay me for days. I got completely wound up and upset and worried, so we hopped out of the queue to grab some water. Honestly, I was more upset that I'd messed up our schedule or I'd ruin our day, but after some water and a slow walk towards the castle, it eased off. Thank goodness! I was so upset. We only had this one day in the park and everything was on such a tight schedule, and now it was all messed up thanks to a phantom migraine. Ugh. Gonna split this up into multiple entries to save image spam. I will return, hopefully soon, with DISNEY INVASION #3! 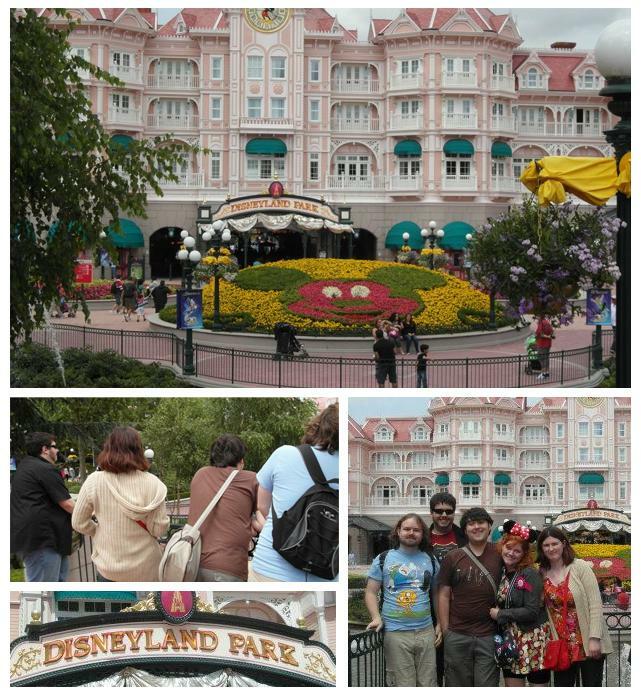 So, like, seriously, if I can find the money, can I invite myself along next time you all go to Disneyland? I've never been to any of the parks! :( We drove past the one in Orlando, but never went inside. That is a rare sight oddly. Honest!